A real head-turner. 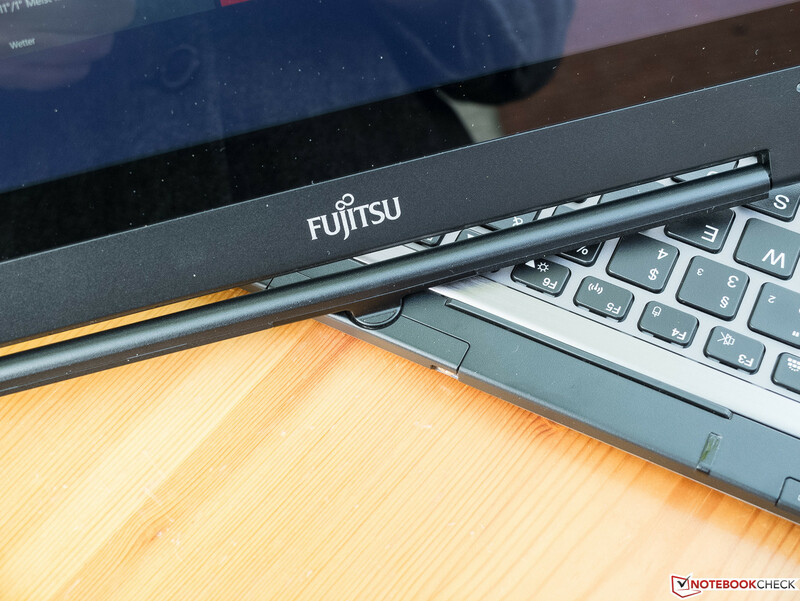 Fujitsu puts a new convertible on the market that woos deep-pocketed business customers with a ULV Core i7, QHD touchscreen, security features and LTE support. How does the rotating joint concept do compared to other business devices? Can its connectivity options and ergonomics stand up to the demands of professionals? Our review tells it all. Does the T904 deserve as good as score as its predecessor, the T902? 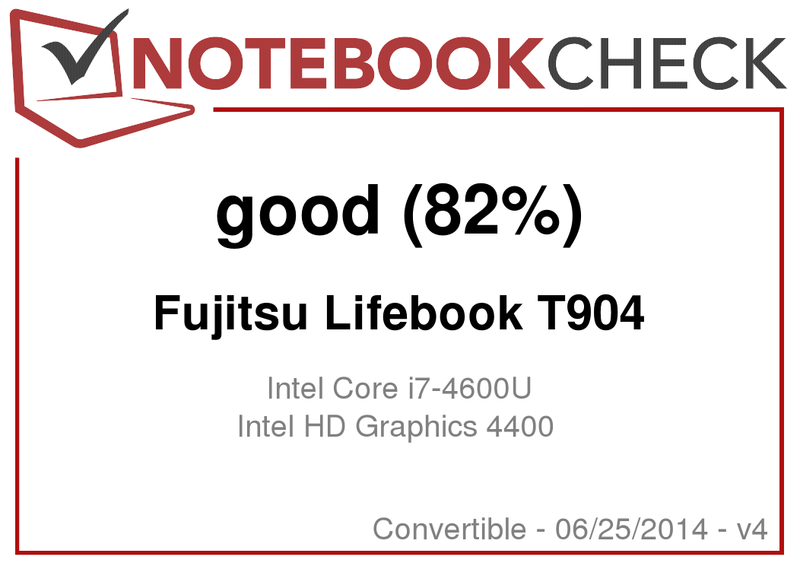 The Fujitsu LifeBook T904 is the successor of the T902 -- a notebook that performed excellently in our tests and earned a very high grade of 89% (under our old rating system). 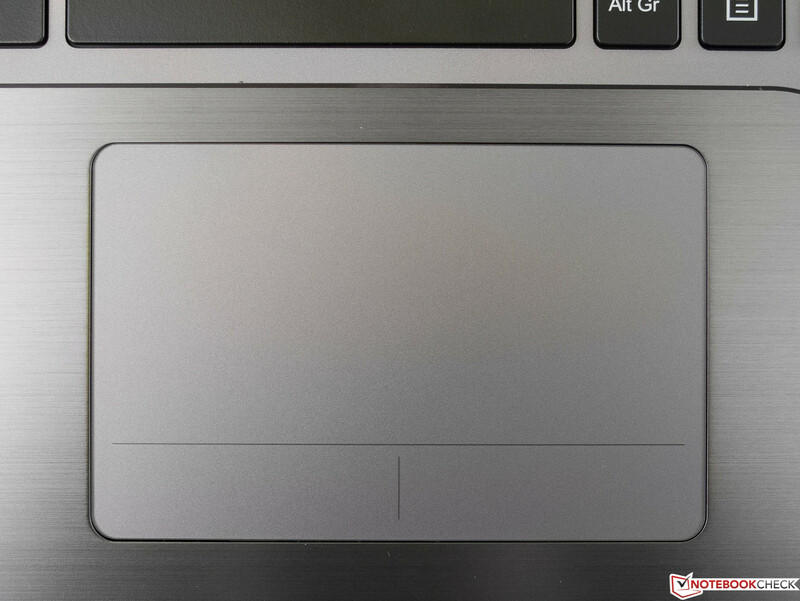 The manufacturer made noticeable changes to the case, which now has a substantially larger touchpad, though as a result the special keys underneath the display have disappeared. 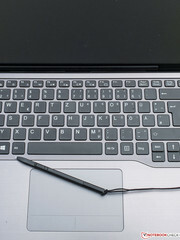 The turn-and-fold mechanism that allows the ultrabook to be converted into a tablet is the same, and the fingerprint reader remains in its unusual but practical position to the left under the display. In their specs, Fujitsu calls attention to the T904's three possible processors, the choice between Windows 7 Professional, 8.1 or 8.1 Pro, as well as myriad mass storage options, all of which should be available in the line. 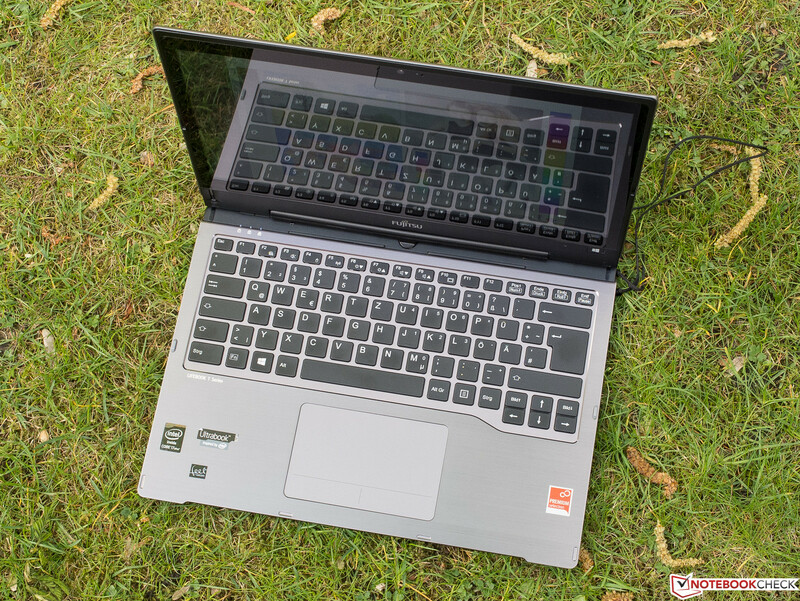 In a German price comparison, at the point in time in which this review was written, besides the version we are reviewing with an Intel Core i7-4600U (2x 2.1-3.3 GHz, Hyperthreading, TDP 15 W) and a 256 GB SSD, the only other option is about 400 Euros (~$557) cheaper and is outfitted with an i5-4200U processor (2x 1.6-2.6 GHz, Hyperthreading, TDP 15 W) and a conventional 500 GB hard drive that gains speed through its 16 GB SSD cache. To assess the business convertible ultrabook relative to its competitors, we will compare it to the Lenovo ThinkPad Yoga, which can be expanded to perform business functions, and the HP EliteBook Revolve 810, whose target audience is professionals in need of a mobile device. The Yoga can be transformed into a tablet by opening the display 360°, leaving the keyboard underneath. The Revolve functions much like our review device, using a similar turn-and-fold mechanism. The three devices' hardware is more or less on par with each other -- particularly noteworthy is the fact that they are all equipped with SSDs, though at 256 GB, the Fujitsu computer has twice the storage space. 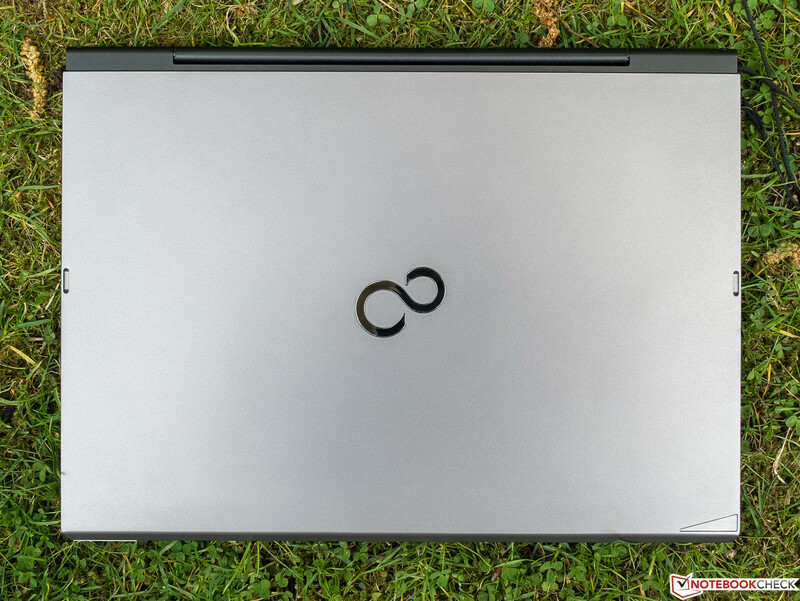 To justify its higher price compared to the Yoga and the Revolve, the LifeBook also has a display with QHD resolution, while the (12.5-inch) Yoga's display only has Full HD resolution, and the (11.6-inch) Revolve merely offers 1366x768 pixels. In terms of weight, the LifeBook and the ThinkPad both come to about 1.6 kg (~3.5 lbs), while the Revolve weighs in at 1.35 kg (~3 lbs). The aluminum case is dominated by neutral silver tones on various surfaces. Despite the difference in materials, the aluminum underside and magnesium back of the lid look very similar with a soft matte shimmer, while the surface on the base of the device has a subdued brushed-metal finish. One part of the display frame gleams in black, lending it continuity with the glossy display, whereas the rather large outer frame above the hinges is a matte black. The slightly sunken keyboard bed features a light gray. 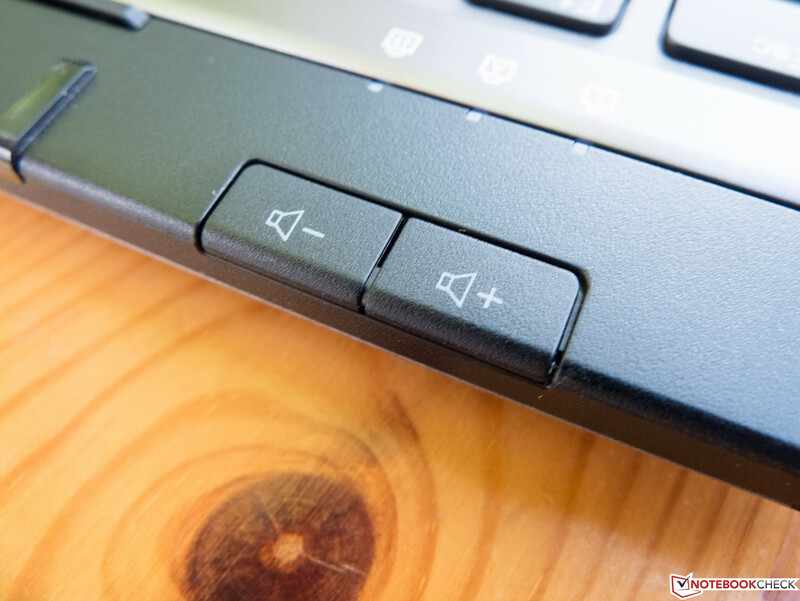 The central pivoting mechanism, which is more solid than it looks, allows the user to turn the display 180° and fold it onto the keyboard, converting the device into a tablet. 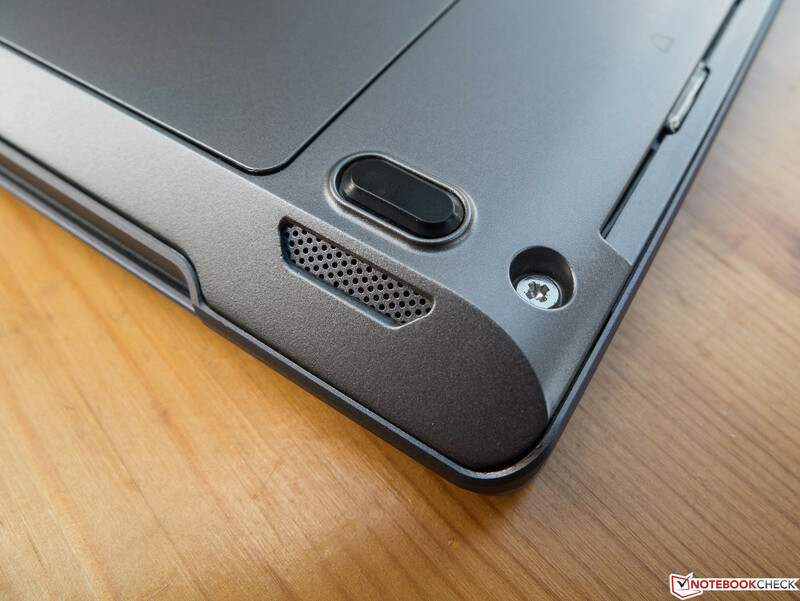 The construction is delicate, and should the ultrabook fall while open, it is almost certain to incur some damage. 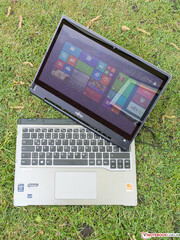 Even so, the concept also has its advantages: The mechanism takes up very little space, so the convertible looks more like a normal notebook that the Asus Taichi with its two displays or the Sony convertible, whose construction has a much more jagged appearance than that of our review device. 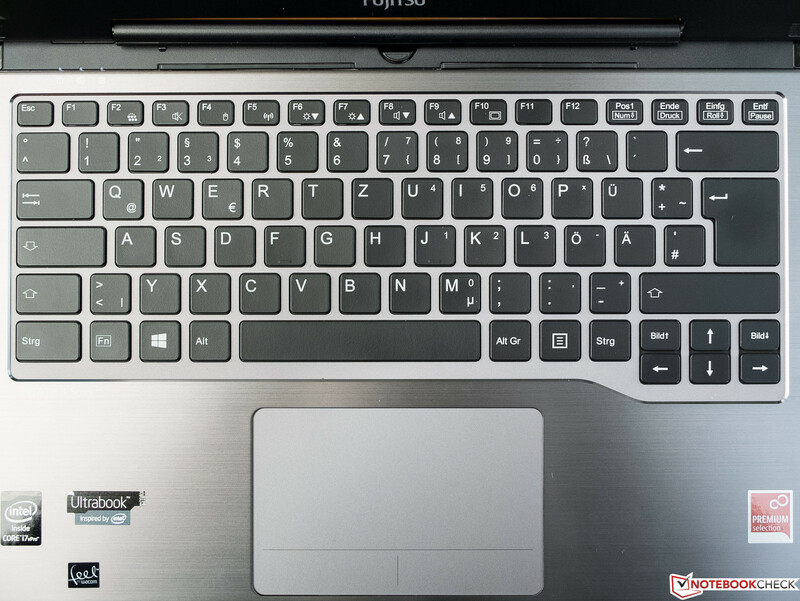 Thanks to various design elements typical of Fujitsu devices, like the keyboard bed shifted under the cursor keys, our convertible can be recognized as a Fujitsu product. 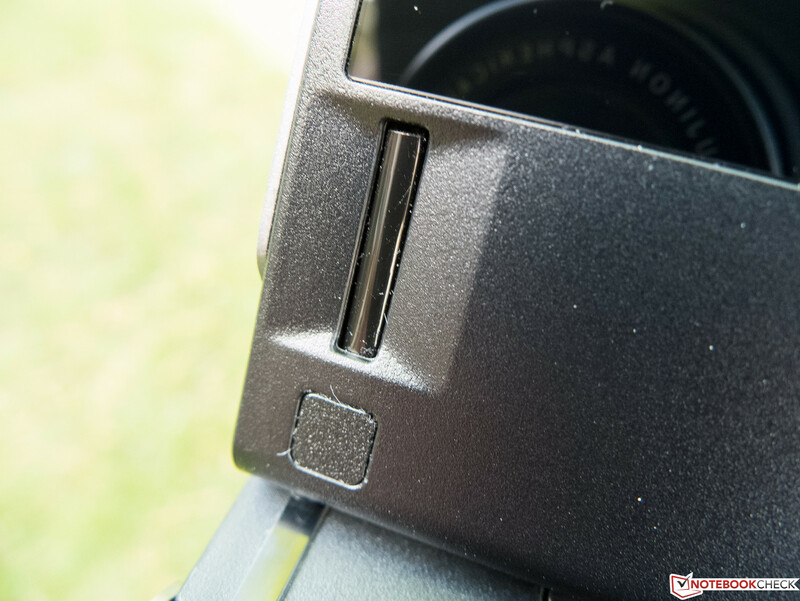 From our point of view, however, overall the device offers a relatively simple look. Because many business users prefer an understated appearance, Fujitsu strikes a good balance here. The base unit was especially impervious to our attempts to twist it. The lid, which is quite stiff and cannot be opened with one hand, exhibited the same characteristics to a lesser degree. 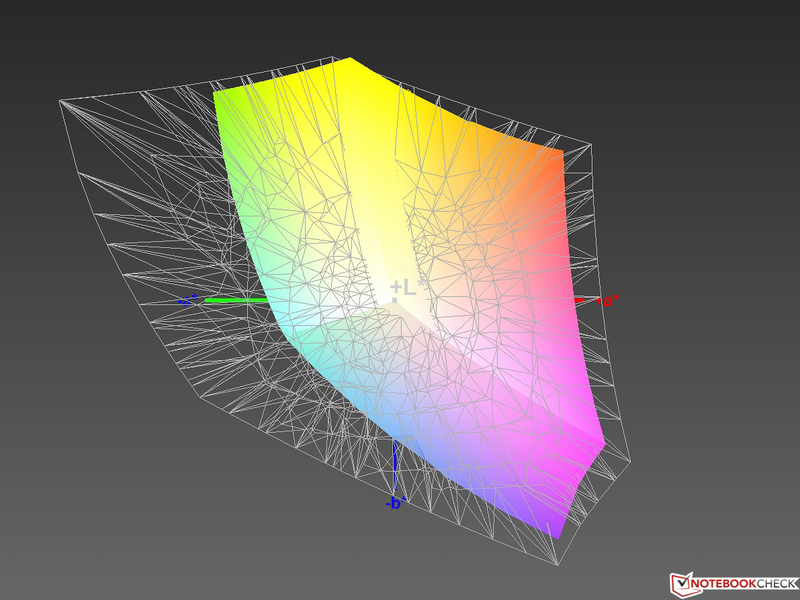 When we applied strong pressure to the back of the lid, however, it did generate distortions in the display image. We did not notice any manufacturing defects, such as uneven gaps. It would have improved the overall ergonomics of the device if Fujitsu had rounded out the upper edge of the base unit a little more. 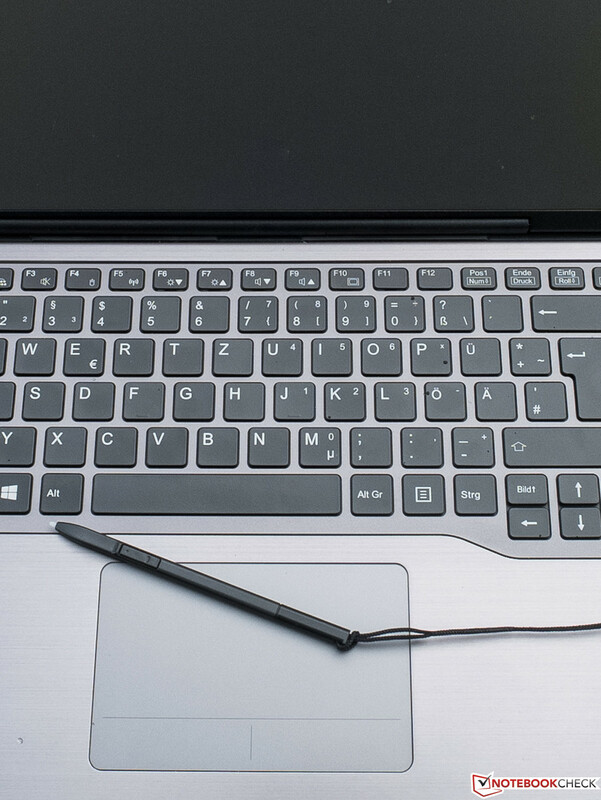 Due to its format and flat construction, like most ultrabooks, the T904's connectivity options are limited. Finally, a manufacturer dares to leave out the undead VGA output from the year 1987, though some conference rooms may still harbor outdated projectors and the like. The only problem is that Fujitsu neglected to balance out the VGA's absence with a more future-proof DisplayPort -- instead they equipped their convertible with just HDMI and wireless transfer technologies like Intel Wireless Display. 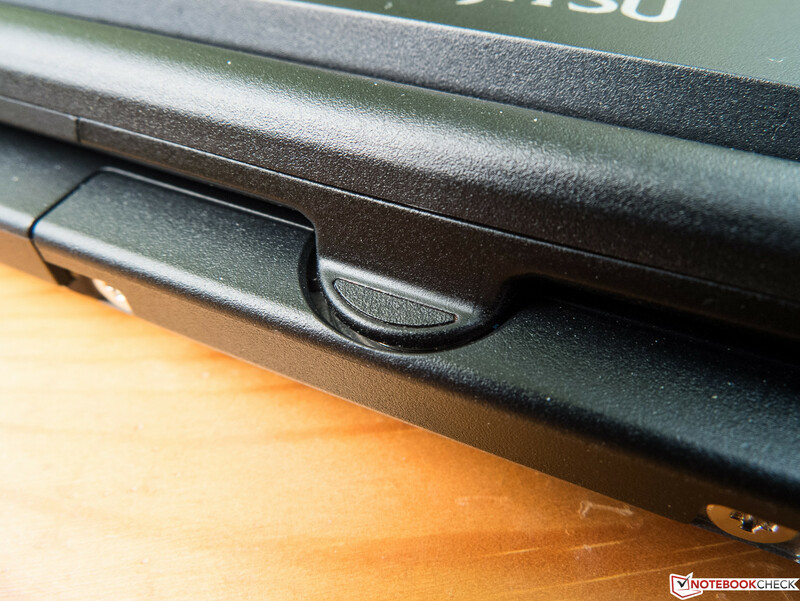 Ergonomically, Fujitsu did a sloppy job of placing their ports, which are almost all located on the front side. The only exception is an Ethernet port that folds out by means of an innovative mechanism. On the underside of the device, there is a proprietary docking port. The stylus is fastened to the device and can be stowed away in the back right side of the convertible -- very nice. In the realm of communication Fujitsu goes all out, at least on paper. Alongside the quite new (though already available in numerous business notebooks) dual-band Intel Wireless-N 7260 module (2x2 BGN + BT 4.0 LE + GPS), there is also a WAN unit from Sierra that supports every current wireless standard in their respective frequencies, including LTE. The HSPA reception proved to be unproblematic, and indoors next to an isolated dormer window, the GPS positioned us within a few seconds. Our tester was not quite so pleased with the WLAN reception quality, which in our individual test setup proved to be below average. This was especially pronounced in tablet mode. While we were playing a game, the streaming download rate, which is limited by the DSL line, fell drastically at a distance of less than 10 meters (~33 feet) from the router and through two walls. This has almost never happened with other notebooks. In notebook mode as well, compared to most other notebooks the author has tested, the T904's antennae were more sensitive to our increasing distance from the router and structural barriers. Considering the device's high price, Fujitsu would have done well to treat the T904 to a module supporting IEEE 802.11ac ("Gigabit Ethernet"). 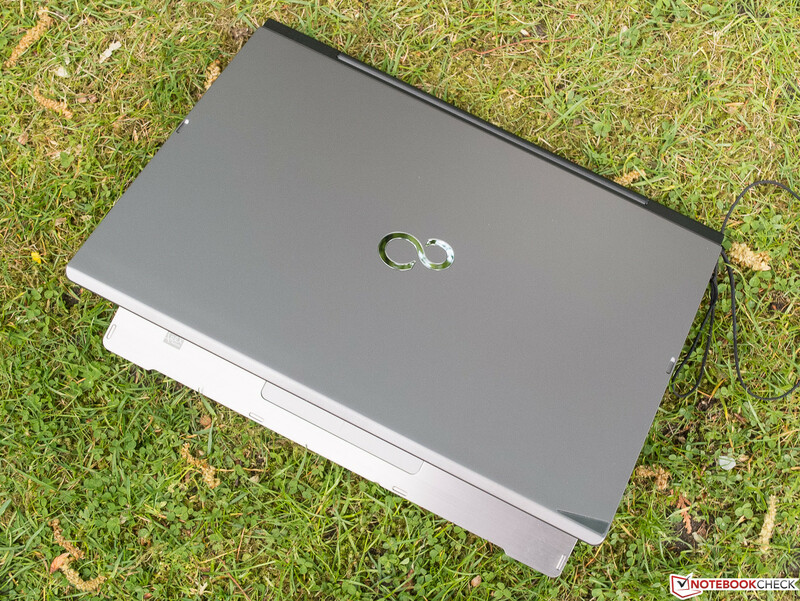 For business customers who are always on the go and often carry important and confidential files on their ultrabook, security features are usually of crucial significance. 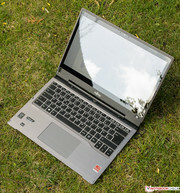 The LifeBook T904 is not directly advertised as having short repair times in cases of hardware failure, but otherwise no wish goes unfulfilled: With Advanced Theft Protection, a fingerprint sensor, a SmartCard reader, OPAL-encrypted drives and the features included in the built-in Trusted Platform Module (version 1.2), everything available on today's market that is conducive to data security should be on board. 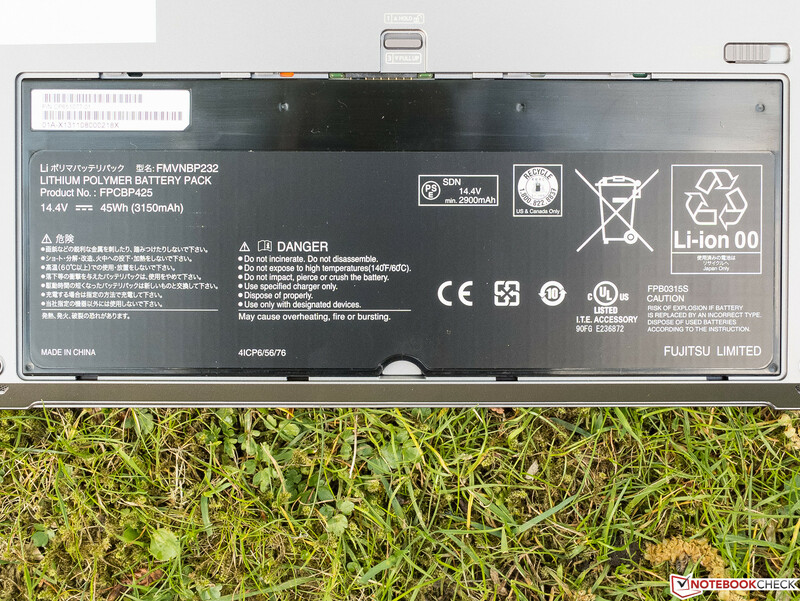 The LifeBook T904's packaging includes a separate "accessory box", but there are no especially exciting accessories tucked into it to accompany the power supply and stylus. Still, Fujitsu does provide the buyer with a microfiber cloth, a recovery DVD, warranty documents and the obligatory quick-start guide. The picture to the above right, next to the "Communication" heading, reveals the particulars about the dock/port replicator that can be purchased at additional cost (starting at 120 Euros; ~$165). We did not come across any further accessories specially designed for the T904. The large, screwless plastic maintenance hatch on the underside of the device can be unlocked with a rather unconventional -- but effective -- mechanism. It allows the user access to the thin, wide lithium-polymer battery. The fan, SSD and other inner parts of the device are only accessible if you void the warranty by unscrewing the case. 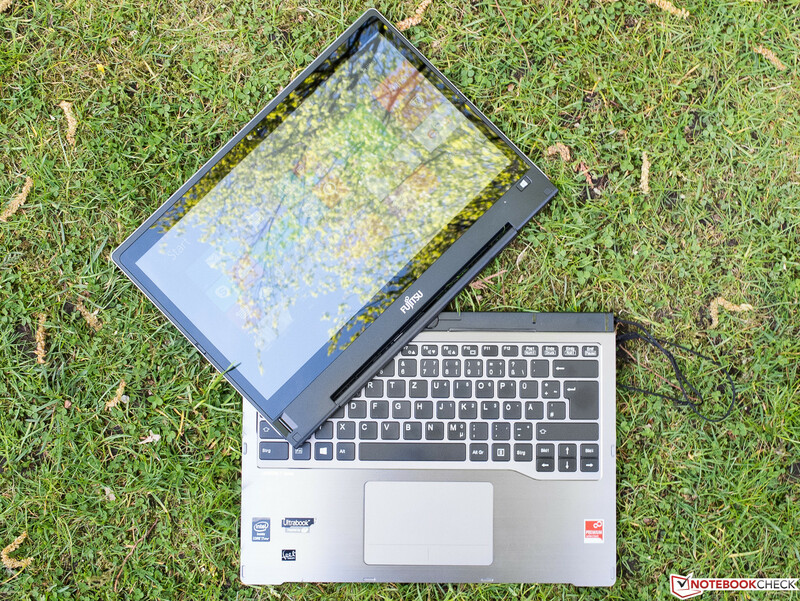 The convertible comes with a 24-month bring-in warranty; Fujitsu's website lists a wide variety of warranty extension packages for purchase. Some of these packages include reduced repair time, which could be important for many business professionals. The costs range from about 120 to 500 Euros (~$165 to $695). As a result of the convertible's flat construction, the keys' travel length is short. The typist reaches the palpable, possibly somewhat soft click-point quickly after hitting the keys. We would characterize the stroke-feel as medium-hard. 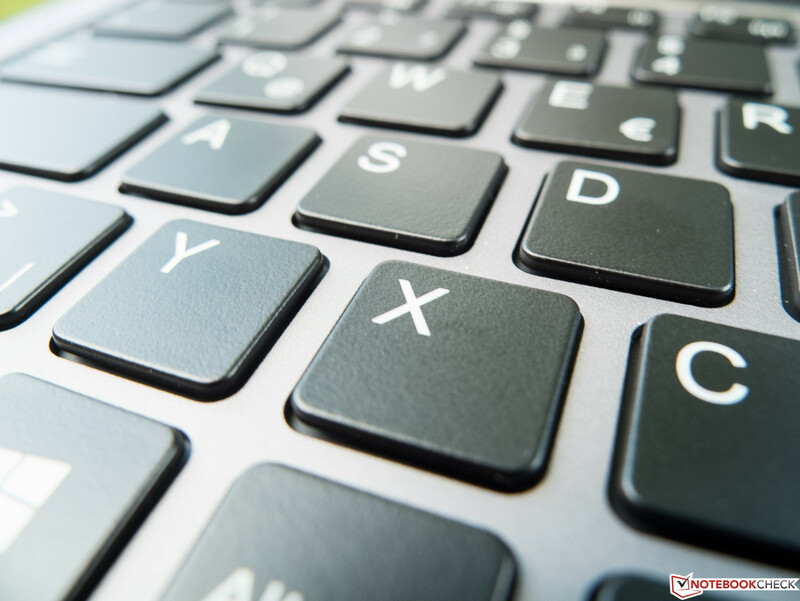 The keyboard took us a little getting used to, but there is no need to fear a decrease in typing speed. The surface of the keys is flat and slightly rubberized, and the two-stage keyboard lighting is uniform and helpful. In realistic circumstances, the keyboard will not bend or sag. In addition, the keyboard produces very little noise, which is always a plus in an office setting. 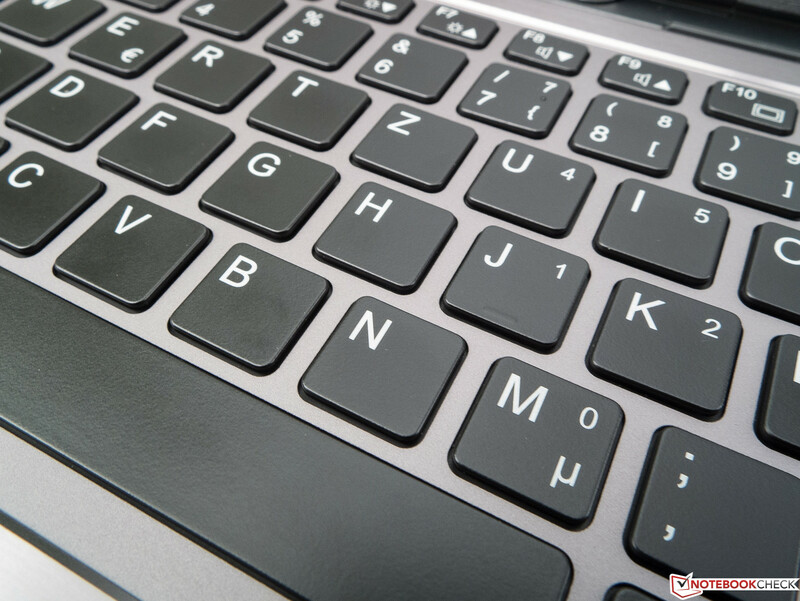 Happily, Fujitsu does not experiment with the standard, user-friendly keyboard layout; the convertible's keyboard looks just like the manufacturer's previous models. 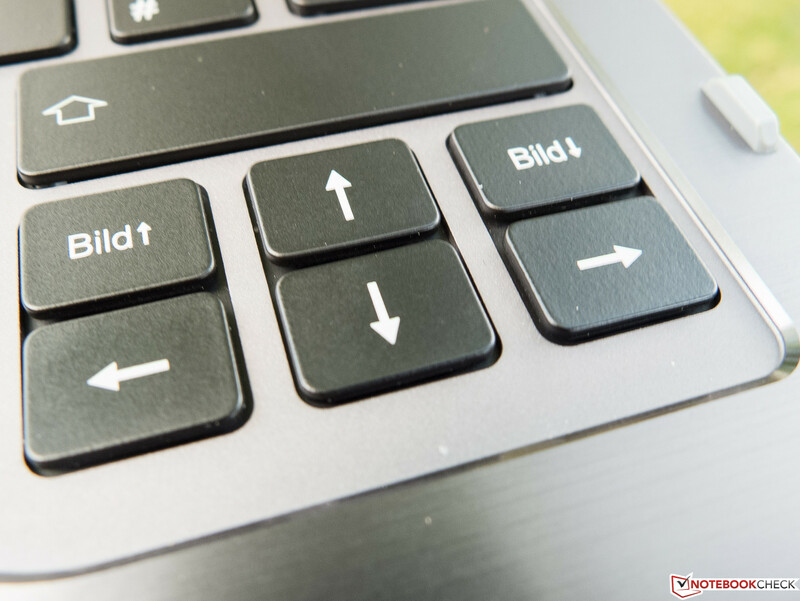 The ClickPad's keys are only visually differentiated from the rest of the completely smooth surface. That means they are integrated into the overall surface, which is touch-sensitive and gives poor feedback. If part of your finger crosses the boundaries of the outer edge, the input is no longer recognized. From a subjective standpoint, the keys' resistance and crisp click-point are ideal. The touchpad's precision and responsiveness are also good. With up to three fingers, the configuration options for gestures could be a little more extensive, but the pad supports the vast majority of gestures a user might require. The touchscreen's responsiveness is perfectly fine. Its precision is also acceptable, though our test device was not quite correctly calibrated, as the point on the screen generated by the stylus was just next to the spot we were touching. Also, the display already began to react to the stylus when it was still hovering a few centimeters from the surface. When we moved the stylus very quickly (which is an unlikely scenario in everyday use), for instance, in suddenly drawing a line, the display was sometimes overtaxed and could not follow the stylus. Our test device's display is based on the IGZO technology Sharp released in 2012 and promises certain advantages, such as a potentially higher pixel density (due to smaller pixels), larger color spaces and lower energy consumption rates. Concretely, we are looking here at a display with the QHD resolution of 2560x1440 pixels (16:9), which is currently becoming more widespread in notebooks. 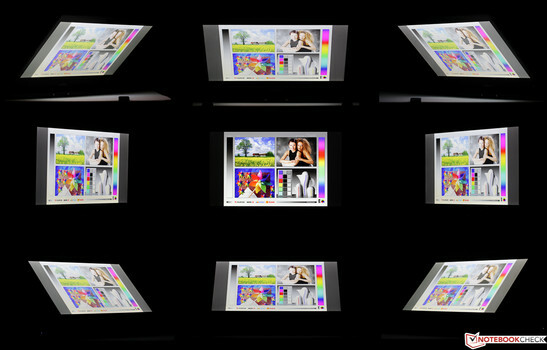 With a display diagonal of 13.3 inches, the pixel density comes to 220 cd/m². That means the pixel size is considerably smaller than even the keenest human eye is able to distinguish, but this resolution also has the advantage (among others) that lower, interpolated resolutions look a little finer than on Full HD displays. Since the panel is a touchscreen, the relatively modest reflective coating is no surprise. Additionally, the screen brightness exceeds that of most matte displays. 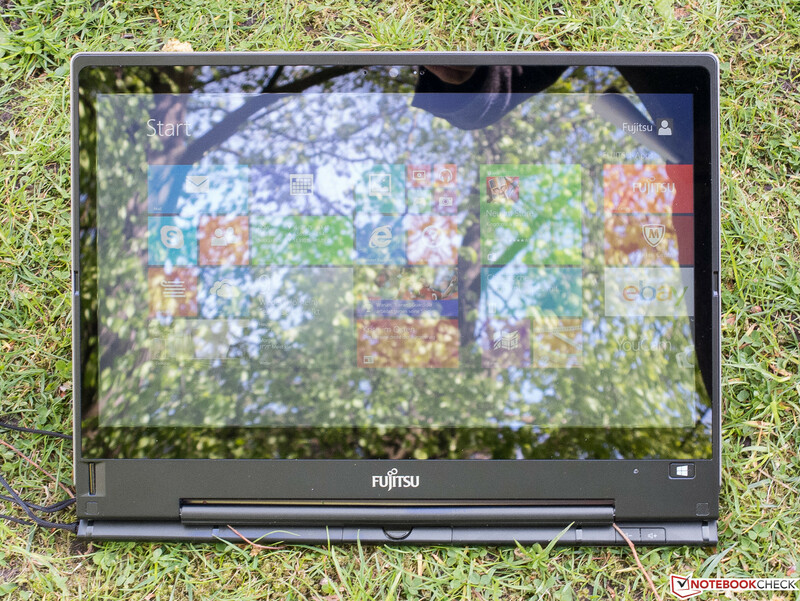 Fujitsu does not offer any other displays for this device. The panel's average brightness of 255 cd/m² is by no means incredible, but there is no reason to complain about it. That said, the ThinkPad Yoga and the EliteBook Revolve come to 55% and 68% higher values, respectively, reaching some of the highest numbers of any convertible we have reviewed. At a 73% similarity across the screen, our test device's brightness distribution is somewhat uneven. In practice, however, this was not very noticeable. Our test device's IGZO technology reveals a few of its strengths in the display's extremely high contrast of 1619:1 and correspondingly low black value of only 0.16 cd/m². The DeltaE 2000 color deviations of about four for both grayscale and ColorChecker straight out of the factory are very good. Other displays do not come so close to the ideal values even after a calibration. In terms of color space coverage, which is only important for (semi-) professional image editing, the picture is clear: With 81% of the sRGB color space covered, the Sharp panel does better than most desktop monitors based on TN technology. Covering a good 60% of the AdobeRGB color space, the display reaches the same numbers as the typical good IPS panel for notebooks. Excellent image sharpness completes the great overall package this display offers. 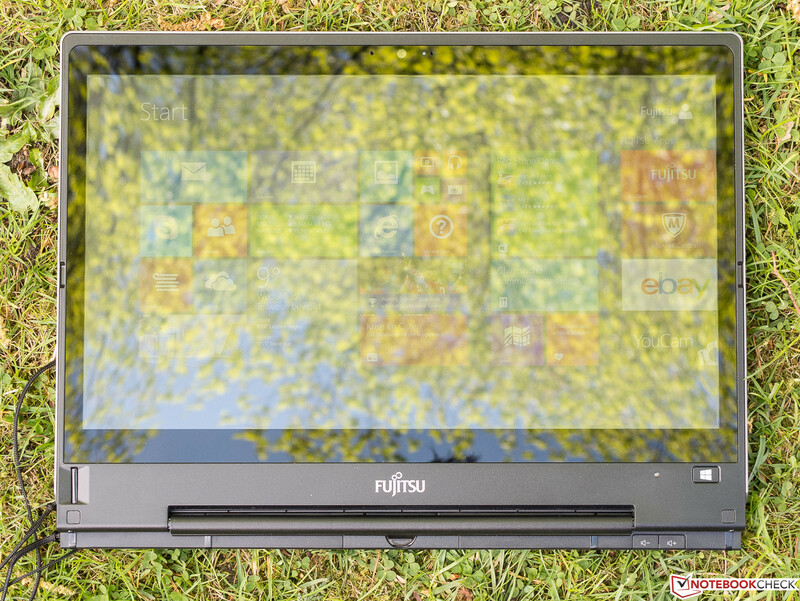 Fujitsu advertises the T904's display as a "wide-view high-bright LED display" with outstanding display qualities outdoors. As a result, we expected a little more than just what one usually sees on a glossy display with an average brightness of about 250 cd/m². On a bright day, reflections take over, and it is somewhat hard to find a place to sit where the display content is visible. Our pictures to the right, taken outdoors, document this problem. Just like indoors, if the background is dark and/or the sky is cloudy, reflections are hardly a nuisance. In the areas of contrast, black value and color space coverage, our test device's IGZO display clearly trumps many notebook IPS panels. When it comes to viewing angle stability, however, our display only lies somewhere between especially bad TN panels and good IPS screens. However, the image distortion produced when observing the display from underneath is completely different from the inconsistencies generated by TN panels. Whereas TN panels invert the image in this scenario, our display loses contrast and looks somewhat milky, no matter from which side you slant the screen. This appearance approximates what you often see on TN displays if you look at them from above. Viewing angle stability is not the IGZO display's greatest strength. Our version of the T904 houses a dual-core Intel Core i7-4600U with Hyperthreading and a TDP of 15 Watt. 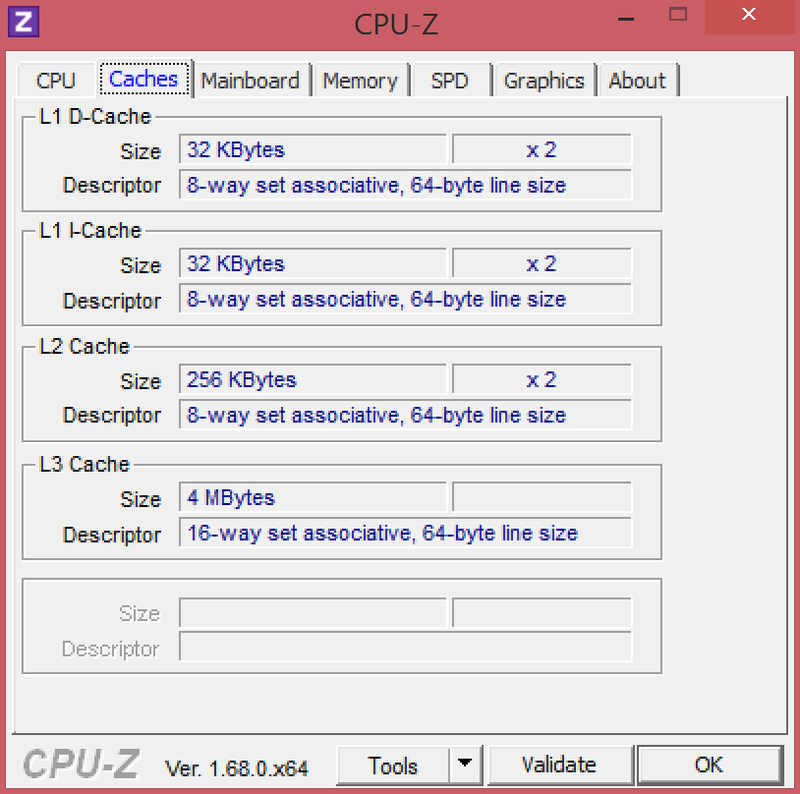 One core of the processor ought to reach a maximum clock rate of 3.3 GHz, and the two cores working together still reach up to 2.9 GHz. The base frequency comes to 2.1 GHz. Aside from software that is optimized for four or more real cores (and consequently parallelized), the performance is easily strong enough for the vast majority of thinkable application scenarios -- though fans of gaming will be left wanting, as the Intel HD 4400 on-chip GPU only fluidly renders very old titles and/or games with little in the way of graphics demands. 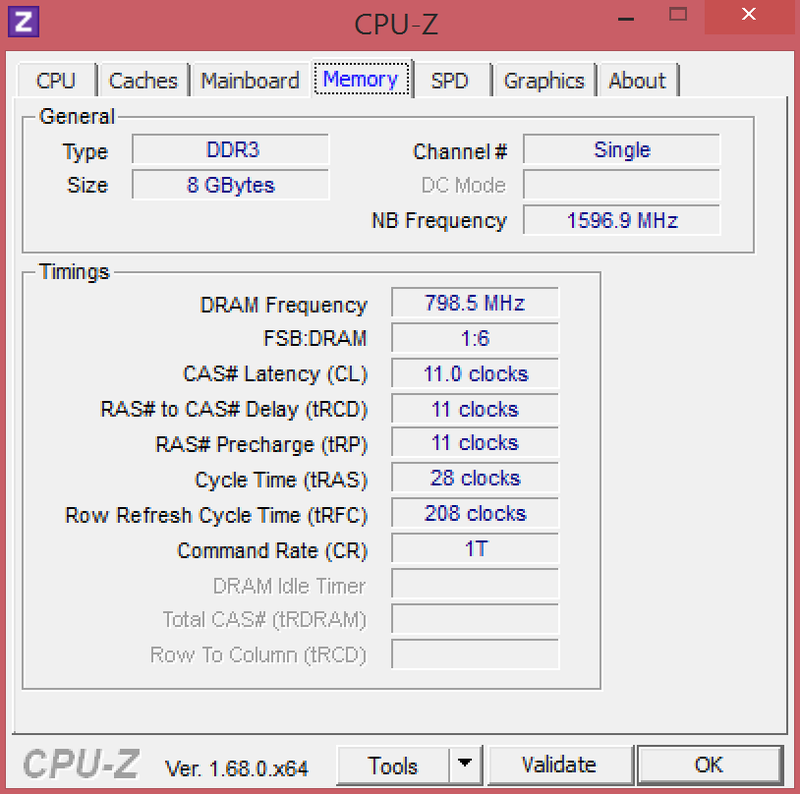 When we ran the Cinebench R11.5 CPU benchmark and worked both CPU cores to capacity, the test device could not reach the clock rate of 2.9 GHz specified in the specs for such situations. 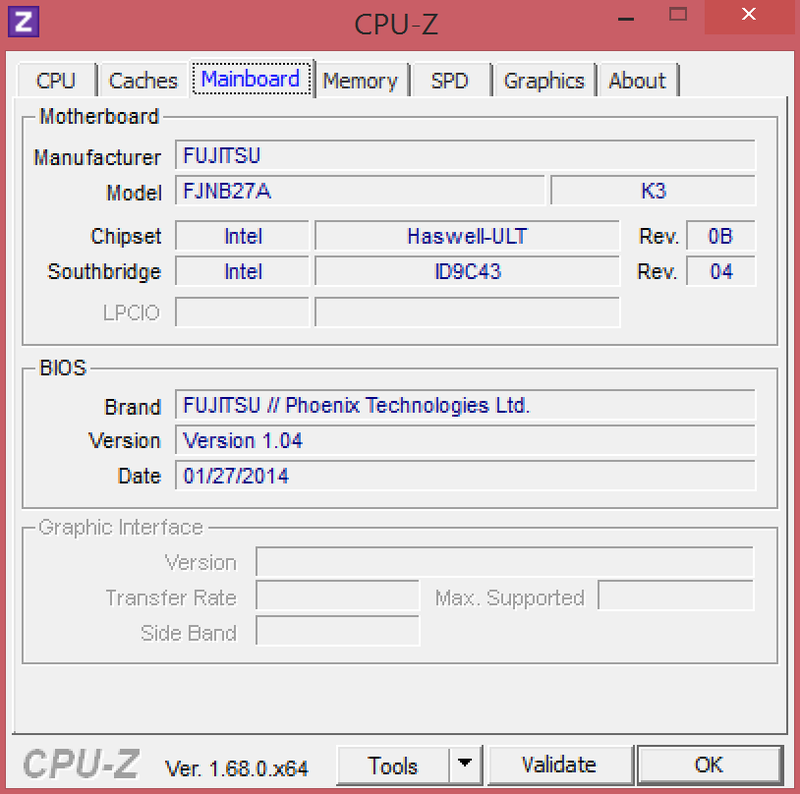 Instead, the LifeBook fluctuates around 2.3 GHz. 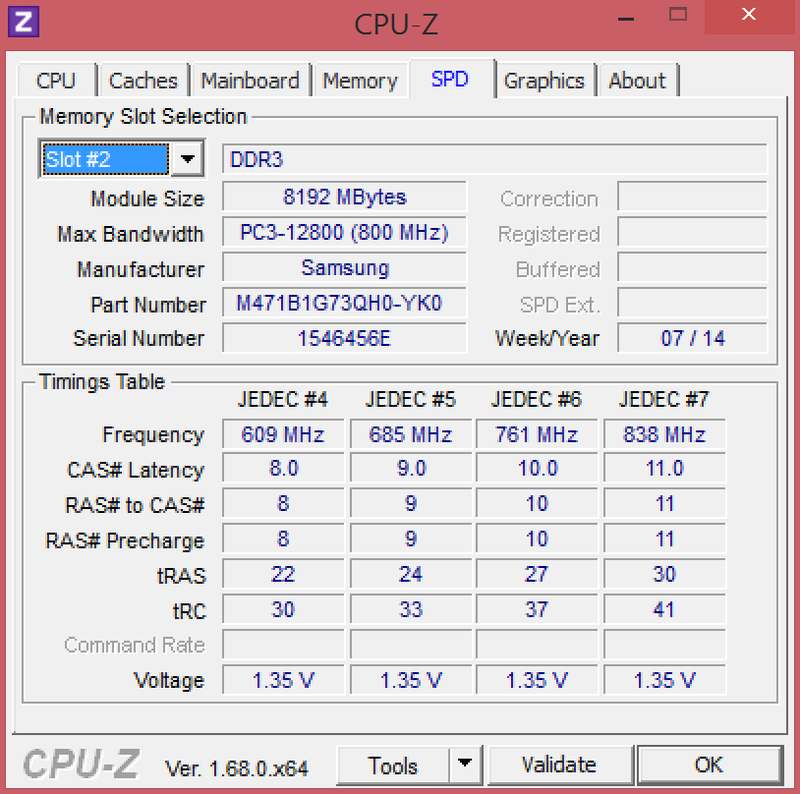 The Intel Core i5-4200U consistently ran at the same frequency in the Lenovo Yoga in this test, which explains why the i7-4600U cannot manage to take the expected lead. In reality, this T904's packaging is deceptive: It says i7, but it only delivers i5 performance. For the application scenarios, most users will encounter in practice, this is of little import; it is simply an unfortunate waste of money. We did not observe any difference in performance between AC power and battery mode. 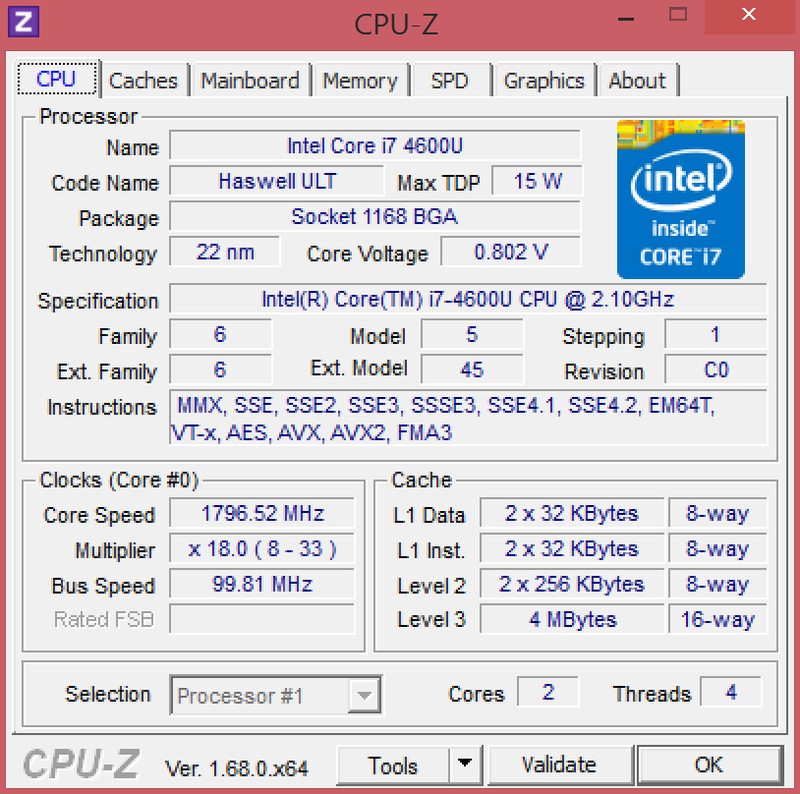 The older i5-3437U (2x 1.9-2.9 GHz, Hyperthreading, TDP 15 W) does well enough and consistently keeps up with the two other processors. If the i7 does not gain much in the way of CPU performance, how do things look in the realm of system performance? Quite similar, and at a high level. Yes, our review device is somewhat faster, especially when it comes to single-core performance -- as you can see, the LifeBook T904 takes a (much too) small lead in almost all the PCMark 7 disciplines. The PCMark benchmarks try to simulate typical everyday scenarios, which of course means that the graphics unit -- and the mass storage device even more so -- play roles of varying importance in the overall performance, depending on the individual test. The fact that the HP EliteBook Revolve always comes in last, yet not far behind, could have something to do with its SSD performance. We will address this in more detail later. As is so often true of devices with CPUs at this high a level of performance plus an SSD, we can attest that in daily use, this system will not frustrate even the most impatient of users. It certainly has more sprightliness than systems with conventional hard drives or HDDs with an SSD cache. The 256 GB Toshiba SSD that Fujitsu installed in their hybrid certainly gets the job done. The Fujitsu convertible's read rates for small blocks of data (4k Read, 4k-64 Read), which are especially relevant for program and system start-ups, are up to 33% ahead of the straggler Revolve; this calls to mind the suspicions we wrote about in the system performance section of this review. The Yoga SSD does well in the 4k Read test, and the Toshiba SSD does too, but with more threads. The CrystalDiskMark 3.0's 4k Read test, which is not as heavily influenced by SSDs, completes the overall picture. All the Solid-State Drives engaged in this competition are so quick that it should be nearly impossible to tell the difference between them in daily use. As a result, these notebooks, which are not exactly what you would call cheap, are justified in their cost. Now we come to 3D graphics performance, which is unlikely to be of much significance to this computer's target audience. 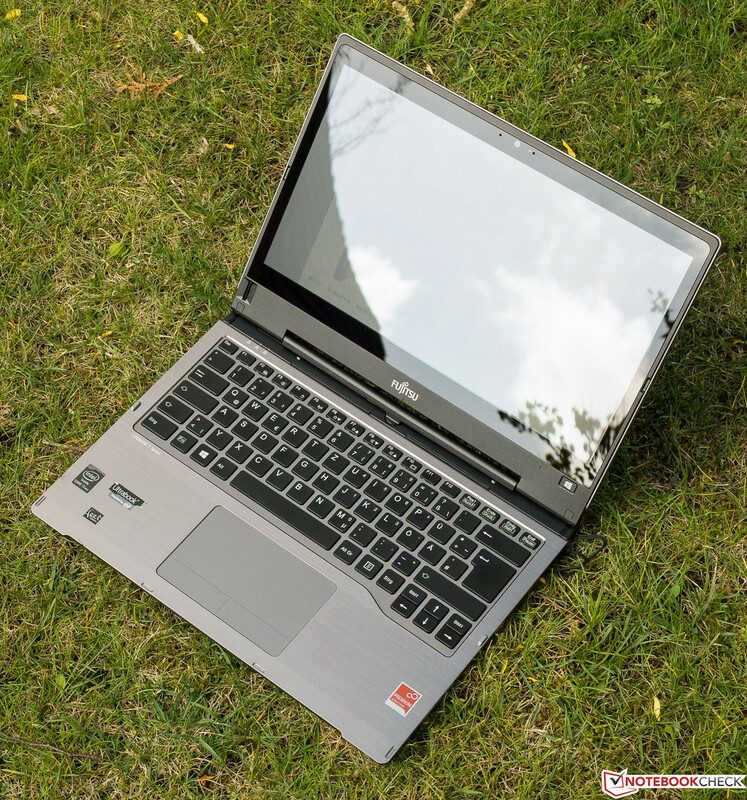 As is to be expected, the 3D graphics performance proves to be low -- the DX9 benchmark Ice Storm Graphics lumps our review device in with the average notebook with an Intel HD 4400. Moving on to 3DMark 11: The graphics units in the T904 and the Yoga are identical, and once again, despite our test device's i7 processor, the Fujitsu machine cannot get ahead of the Yoga -- not even in the CPU-heavy physics benchmark. The Revolve consistently comes in substantially behind the other two devices, which is almost certainly the fault of the older CPU and GPU architecture. 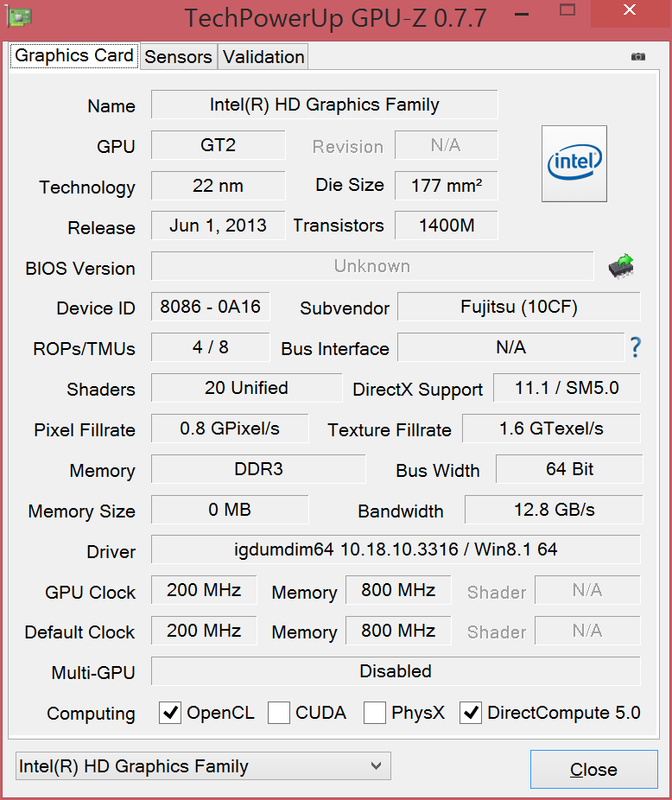 Even at this low performance level, compared to the Intel HD 4000, the HD 4400 is considerably stronger. Users can most certainly play games that demand little in the way of graphics performance, but titles that are simultaneously current and demanding are out of the question. That is especially true for the EliteBook Revolve. Unfortunate: Even at medium settings, in the four-year-old StarCraft 2 benchmark, our test system only reaches what even for this genre is a just barely playable 24 fps. However, the scenario we used for taking our measurements taxed the system more than it taxes the average notebook. At minimum settings, Bioshock Infinite looks quite good -- but unfortunately that is useless, as an average of 28 fps is too little for a shooter game, and the 1024x768 resolution we selected is very low by today's standards. You can find the results of many more benchmark tests performed on the Intel HD 4400, as well as many other mobile graphics cards, in our FAQ section. 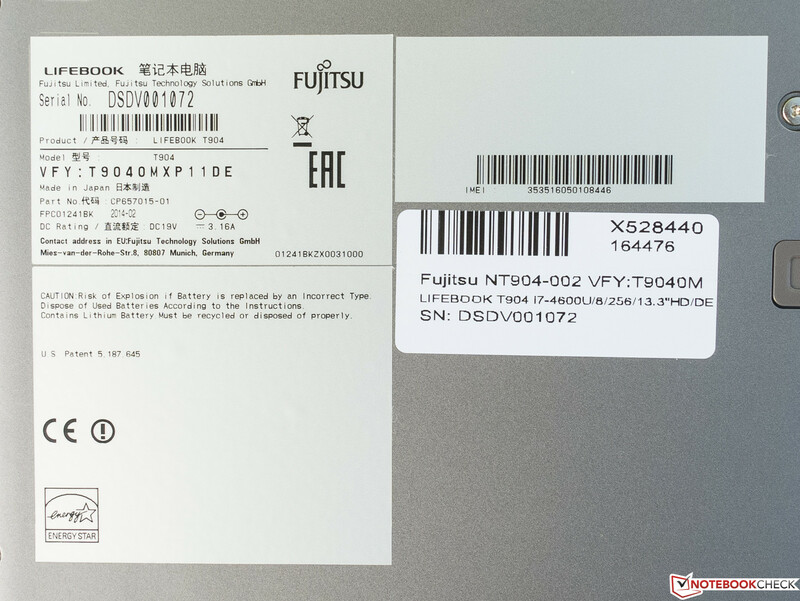 A business ultrabook in this price class must be quiet, and from the perspective of this reviewer, if the Fujitsu LifeBook T904's noise level would have risen as a result of capitalizing on the i7-4600U's potential performance boost (compared to an i5-4200U), the manufacturer had their priorities straight. At 30 dB(A), though audible, in everyday use the sound generated by the variably regulated fan is hardly noticeable when the convertible is surrounded by a normal level of ambient noise. Under medium to full load, however, the machine does reach up to 40 dB(A). The ThinkPad Yoga is the only competitor to go about its work substantially more quietly. Still, we were never bothered by the T904's noise level, which has to do with the fact that it did not generate any irritating high tones. The graphic below says it all: Fujitsu did not allow their device's case to rise to a disconcerting temperature. 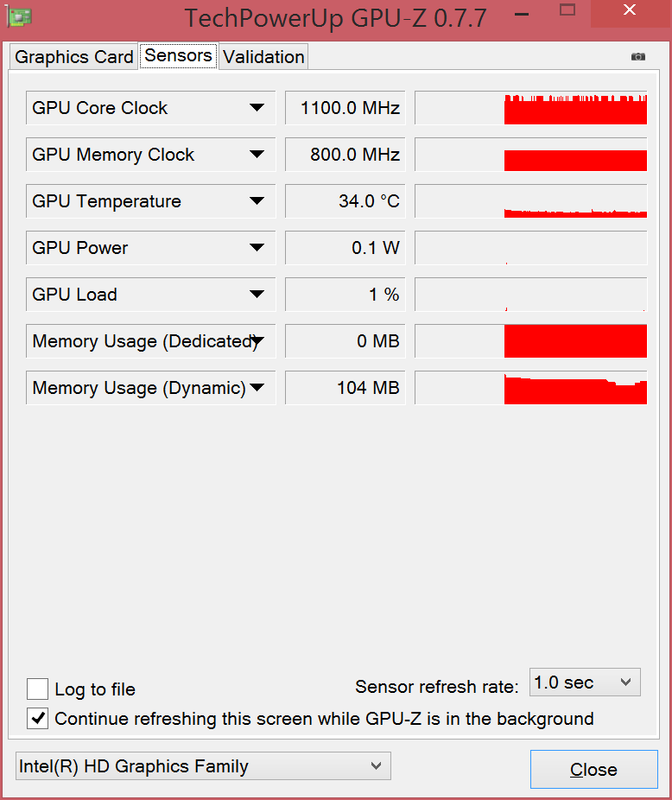 In idle mode, the computer's temperature only rises to a few degrees warmer than room temperature. Under load too, the convertible only reaches a maximum of 39 °C (102.2 °F), and that on the top side, though not in the palm rest area. When it comes to the temperatures on the bottom of the case, it is clear that the convertible can sit on your lap without any problem -- though it is important to be careful that the air intake is not completely covered for too long. In our stress test (Prime 95 + FurMark running simultaneously for an hour), we did not observe any true throttling or CPU/GPU temperatures higher than those listed in the specs. Can a little bit of something be worse than having nothing at all? Maybe. The tiny "speakers" on the T904 are extremely quiet, noisy, and plagued by sound distortion. We are unable to provide a differentiated analysis, as it is neither possible nor reasonable. Let us just say that out of a possible five points in this area, we are only giving the device one, though it may have been better for the convertible not to have a speaker at all. But seriously: We give the device one point here only because the sound can be called "sound" rather than "noise" when it is plugged into your home speakers. Very good: If the T904 still uses energy when it is turned off, it certainly was not enough for our testing equipment to register it. The very small energy consumption rate of 0.1 Watts in standby mode further attests to the convertible's attractively low energy use, and this looks even better when compared with current notebooks in the same format: Depending on the scenario, our test device is either one of the most energy-efficient devices period, or it falls in at least the top 25%. As the computer only consumes a maximum of 24 Watts under full load, the power supply's capacity is unquestionably large enough in any situation. To determine a device's maximum battery life (idle mode), we set the display brightness as low as possible, completely deactivate power-hungry components like WLAN, and select the energy-saving profile in which every available energy-saving function is activated. Our test device comes to no less than 17.5 hours in this mode. 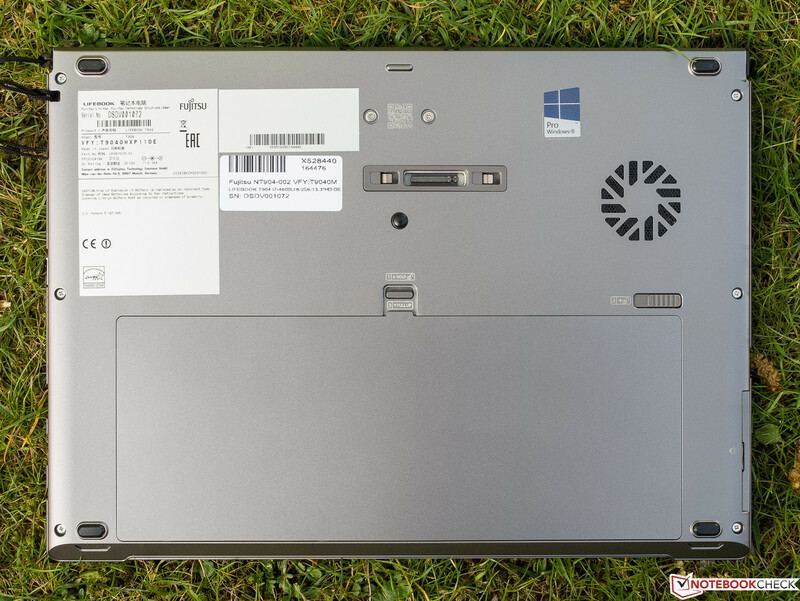 The HP EliteBook Revolve is an average of about 57% behind our T904 in this discipline, which is most assuredly the result of its 47 to 163% higher energy consumption rate (depending on the level of load), as our three competing devices have very similar battery capacities (F:45/L:48/HP:44 Wh). For the same reason, our LifeBook's battery life under load ought to be longer than that of the Revolve, but in reality, the two devices tie at about two hours. The most important test, however, is our WLAN surf test, which is intended to simulate practical, everyday use. 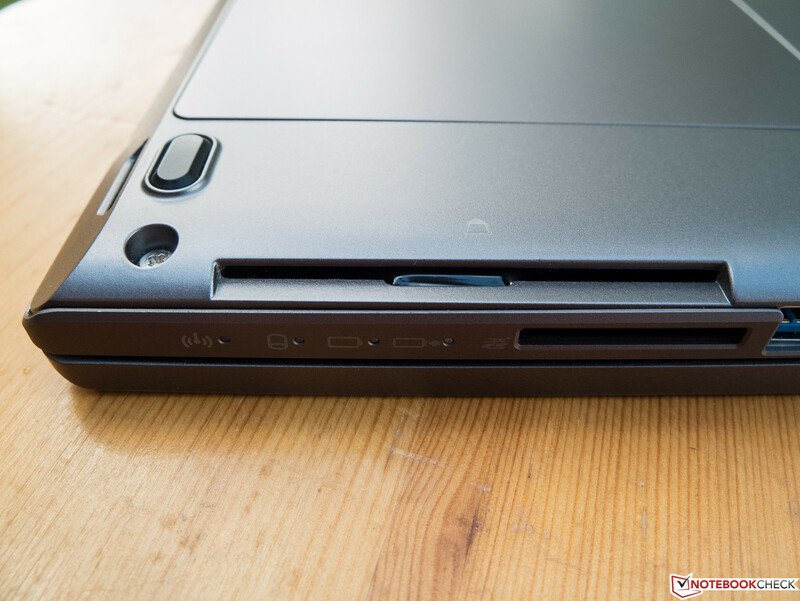 At medium brightness and with the energy-saving profile activated, the ThinkPad Yoga takes the crown with its above-average run time of 7.5 hours, but with its nearly seven hours of steam, the Fujitsu still proves itself to be fully deserving of the "mobile" designation. Fujitsu does not offer any alternative batteries. The Fujitsu LifeBook T904 is a neat 2-in-1 business package with a big price tag. Interestingly, the Windows 8 world seems to have started trending towards operating touchscreens with a stylus rather than with fingertips. QHD displays are another trend, IGZO a third, and multi-frequency LTE a fourth. The LifeBook T904 includes all of these features, securing a place for Fujitsu amongst the premium manufacturers. The fact that all this new technology is housed in a great, innovative case without manufacturing defects should be a matter of course in this price class, though unfortunately it is not always so. One of the best attributes of the T904 is of course its flexibility, and that, without doing much damage to the device's ergonomics. 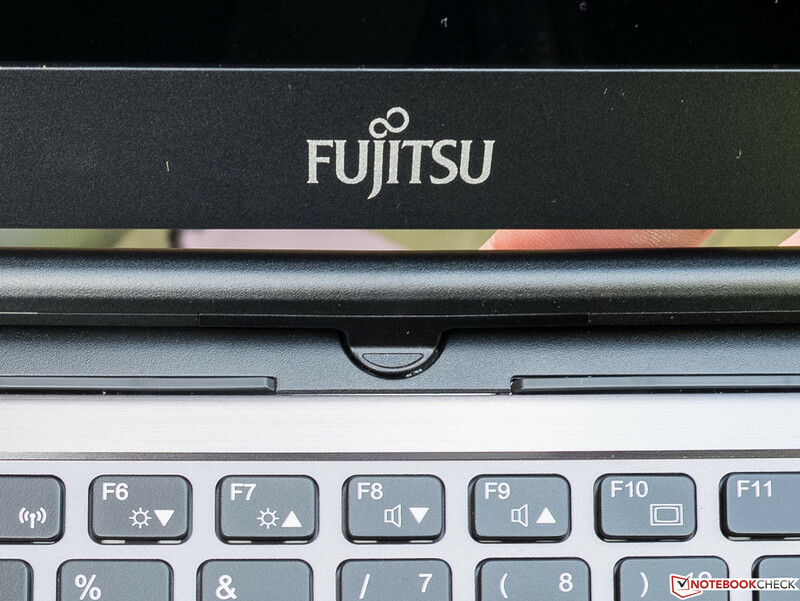 Fujitsu also has their convertible's noise level and heat management firmly under control, which requires careful construction when it comes to such devices. Thanks to its top-of-the-line SSD and quick CPU, the performance is strong enough for most normal application scenarios (even if the CPU cannot reach its full potential). Clearly, the manufacturer made a bit of a blunder when it comes to the integration of the WLAN antenna, which could pose a real problem in the internet-dependent business market. 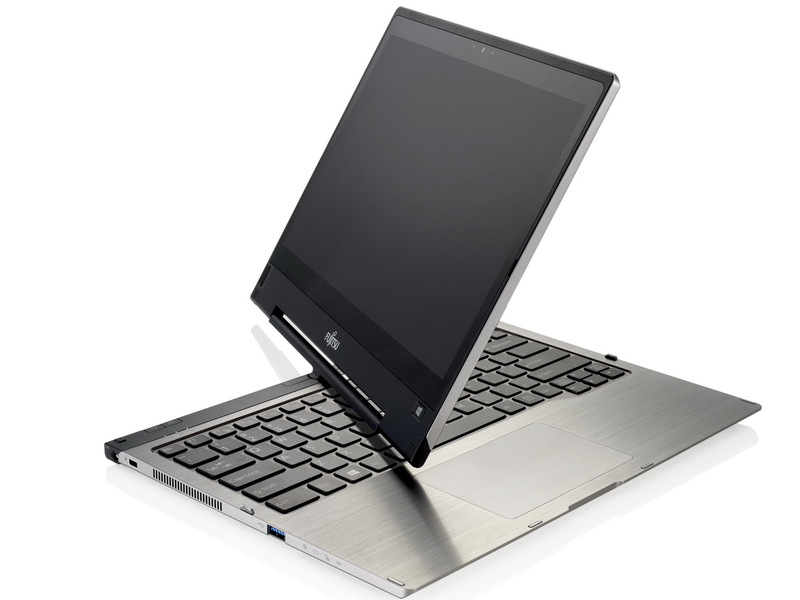 The premium LifeBook is not particularly suited for presentations with background sounds, unless it is connected to external speakers. However, it balances out that shortcoming with modern security features (some of which are Intel-based) that should be comprehensive enough to meet high demands in this area. If you are looking for an especially bright display with stable viewing angles, the two smaller competing devices are perhaps better equipped, though the HP EliteBook Revolve 810's low WSXGA resolution is only acceptable due to its 11.6-inch format. 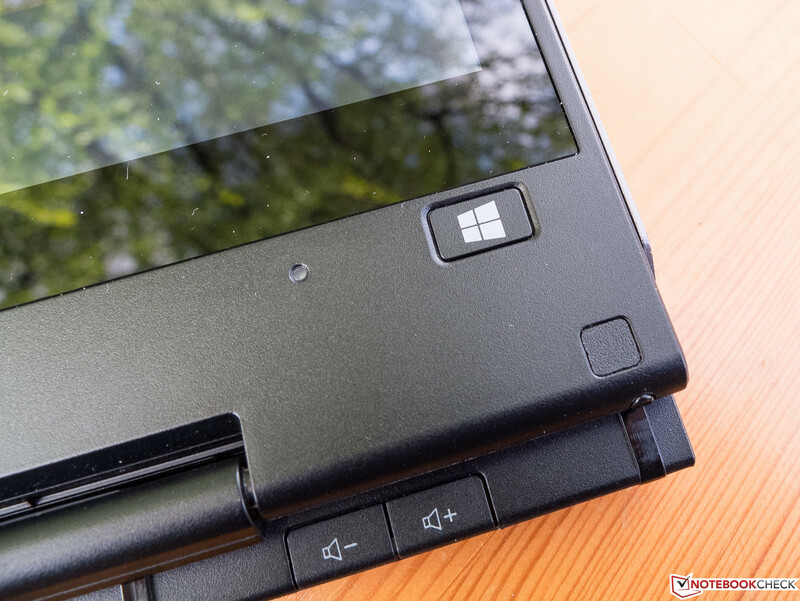 Though its keyboard proved to be especially praiseworthy, the ThinkPad Yoga is missing a variety of security features, such as a fingerprint reader and SmartCard reader. The Revolve, which is more targeted to business customers than the Yoga, cannot offer those two features either, but otherwise it is on par with our test device in the realm of security. ...than some other new mechanical concepts. This is no image distortion: The tube is slightly curved. ...as on a desktop keyboard. ...but the typing experience just isn't quite right. The stylus, with the display turned backwards. The clickpad: Simple, smooth, functional. ...are still accessible in tablet mode. The color scheme continues on the bottom side. Less than optimal: A lot of air is sucked in through the bottom. Lithium-polymer batteries can take many forms. The manufacturing quality is excellent. The IGZO display plays in the top league. 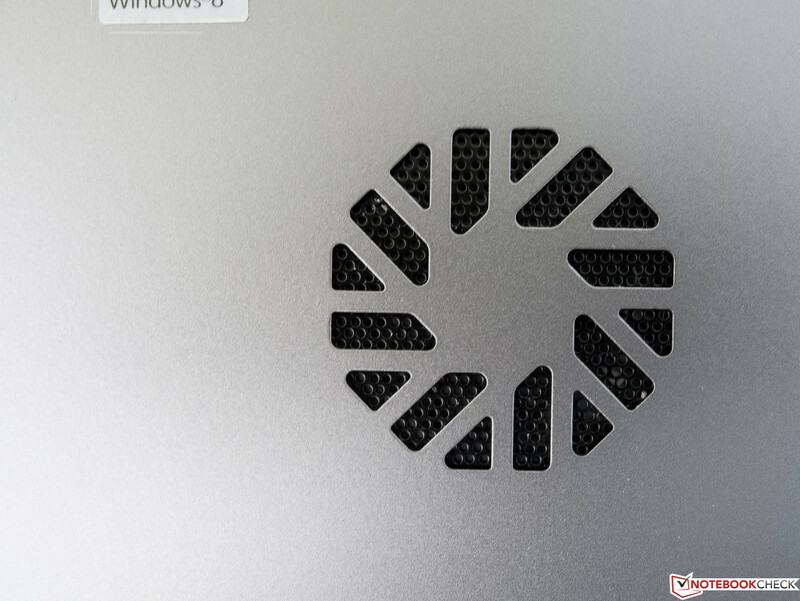 An easily attainable, cheaper model with an i5 processor and SSD. 1.6 kg, 13.3 inches -- yet the HTC One's speakers still sound much better.